Baldwin will have one more week to rest All-State wide receiver Chase Nakamura, right. 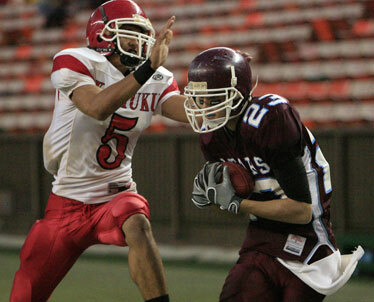 Who knows when Kahuku last opened a football season 0-3? It's been years since the Red Raiders opened with two losses, which is what they've done so far this year. Of course, those two defeats came at the hands of two outstanding foes: Hawaii defending state champion Saint Louis and Utah state champ Bingham. Safe to say, Kahuku will be ready to roll when unbeaten Kalaheo arrives for a showdown tomorrow. Another epic battle could be brewing tonight when rivals Leilehua and Mililani clash at the Trojans' field. For lifelong Kahuku football fans, it was the play of ultimate stress. For Baldwin faithful, it was -- and still is -- perhaps too painful to relive. When Kahuku used a gadget play to surprise Baldwin for a last-second 25-22 win in the state semifinals last year, jaws hit the FieldTurf on the Bears' sideline. With key players on offense and defense returning as seniors, Baldwin is on a mission this season. All the promise of another Maui Interscholastic League championship and a potential return to the state tourney is on hold, though. A 38-15 loss to San Clemente (Calif.) could be a demoralizer, or perhaps a wake-up call. The Bears played without some key players, including All-State wide receiver Chase Nakamura. Against a swarming defense, Baldwin quarterback Jordan Helle struggled. Baldwin's all-team starting offensive line is up against history and high standards. Helle, a stand-up pocket passer, is heavily reliant on his trenchmen. San Clemente's defensive coordinator, Jamie Ortiz, studied tape of Baldwin -- including the loss to Kahuku -- for weeks before the encounter at War Memorial Stadium. "They're an explosive team. You could tell (on tape) that Baldwin plays with great pride and heart," Ortiz said. "They were five seconds from beating the eventual state champs." One factor in San Clemente's favor is that their offense runs a near-identical system to Baldwin. "We wanted to give Helle different looks and bring blitzes from different sides. Our defensive backs did a good job of disguising our coverage and we got pressure on Helle when needed," Ortiz said. One memory Ortiz and the visitors from California took back home was the intense rivalry of MIL football. "I think our kids learned a lot about Maui. They were amazed as to how beautiful the island is. Many of our players and coaches were greeted with open arms around Lahaina as long as we promised them that we would beat Baldwin," he said. Ortiz says head coach Eric Patton plans to bring the team back to Hawaii in three years. By then, they'll have one less problem to deal with. "Chase is a huge weapon for Baldwin. He is good for at least two touchdowns a game and he can really stretch the defense with his height and speed," Ortiz said. "He's a game breaker." Nakamura and his teammates will rest this weekend before opening MIL play against crosstown rival Maui next week.